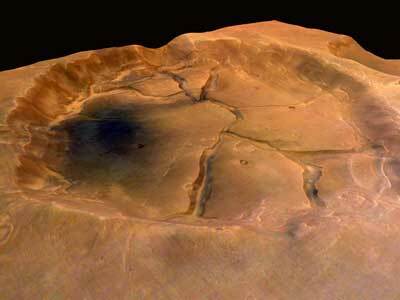 Mars Crater - Universe Galaxies And Stars Section. crater on the surface of Mars. This perspective image of a fractured crater near the Valles Marineris was taken by the European Space Agency's Mars Express spacecraft during its 61st orbit in January, 2004. The image was obtained using its High Resolution Stereo Camera (HRSC), which enables scientists to build a realistic 3D model of the surface of Mars which can then be tilted and rotated to examine from different angles. scientists aren't sure why the floor of this crater is broken up like this, but it could be from cooled lava, dried clay, or frozen ground. The image was taken during orbit 61 in January 2004 with a resolution of 12. 5 metres per pixel. It shows part of a cratered landscape to the north of the Valles Marineris, at 0.6º S latitude and 309º E longitude, with this crater having a fractured base.